A frontier western musical, Seven Brides For Seven Brothers bursts with colour and song. Humour and boorishness collide in a mostly enjoyable romp, with some lingering rough spots. In the Oregon Territories of the mid 1800s, backwoodsman Adam Pontipee (Howard Keel) comes to town in search of supplies and a wife. He scours the town for a suitable bride, and settles on Milly (Jane Powell), the resourceful attendant at the local eatery. Milly is happy to be swept off her feet by the burly stranger and they get married immediately. But Milly is shocked to discover that Adam shares his mountain cabin with six younger brothers. Benjamin, Caleb, Daniel, Ephraim, Frank and Gideon (Russ Tamblyn) are hairy, dirty, loud and uncouth, and expect Milly to be their servant. Milly recovers from the shock and sets about to turn the brothers into respectable men capable of attracting brides of their own. They are surprisingly receptive, and gradually learn what it means to be civilized. But Adam wants to hang on to more barbarous traditions of behaviour, setting the brothers on a collision course with the townsfolk when it comes time to find brides for all of the Pontipees. 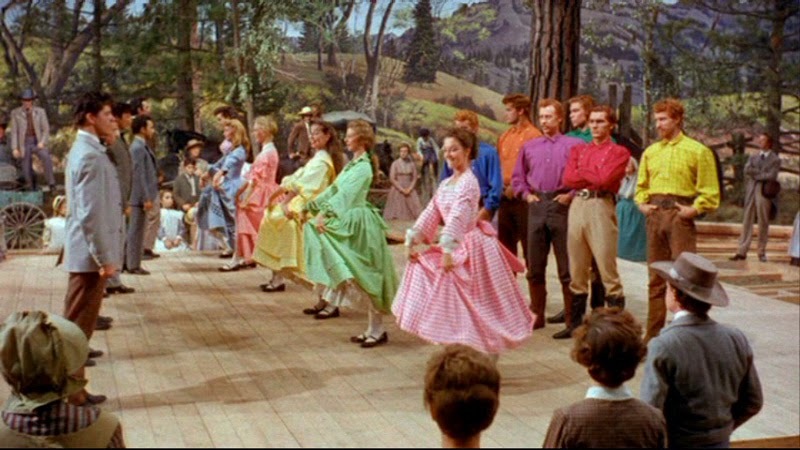 Directed by Stanley Donen, Seven Brides For Seven Brothers was considered the lesser of two MGM CinemaScope musicals being readied for 1954, the other being the Vincente Minnelli directed Brigadoon with stars Gene Kelly, Van Johnson and Cyd Charisse. 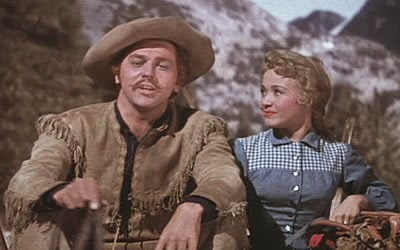 In comparison, Seven Brides offered up the supposedly less marketable Howard Keel and Jane Powell in the lead roles, plus a bunch of unknown professional dancers with limited to no big screen experience. Proving that outcomes can fully ignore expectations, Brigadoon bombed and Seven Brides was a smash hit, and over time has become one of the most beloved MGM musicals. The simple story summarized by the title, energetic dancing, phenomenal staging and several hit songs propelled the film into hearts and fond memories. Keel's deep voice, Powell's indomitable spirit, Donen's eye for capturing dynamic symmetry in motion, the gymnastic talents on display and the Michael Kidd choreography combine to create a celebration of mating at its most basic level. Man wants woman, man gets woman, man keeps woman, and woman likes it because she loves to be wanted by man. Seven Brides For Seven Brothers does not win any awards for portraying enlightened relationships between the sexes, and indeed much of the film's second half comes across as misogynist and demeaning to women. The brides are forcibly kidnapped, separated from their families, and held against their will, but somehow they anyway fall in love with the brothers, and this is all supposed to be cause for great fun and happiness. The screenplay attempts to paper over the medieval attitudes with some hints of irony and vague expressions of remorse close to the film's resolution, but it's too little and too late. Setting aside the suspect attitude, Seven Brides For Seven Brothers resonates thanks to numbers like Bless Your Beautiful Hide (Adam looking for a wife), Goin' Courtin' (Milly and the brothers as they learn how to woo a woman), and the melancholy Lonesome Polecat (the brothers yearning for female companionship, filmed in one haunting take amidst the snow). Good as these scenes are, they are all eclipsed by the classic Barn Dance sequence, an explosion of dancing with acrobatics and a competitive edge, the scene brimming with vivid costumes and unbridled energy while taking full advantage of CinemaScope's potential. Seven Brides For Seven Brothers gets its gender politics wrong, but keeps on stomping the dance floor with a contagious and carefree spirit.